Going Long...And I Mean LONG! | Reliant Systems, Inc.
Last month we talked about miniaturization in the precision motion industry and the challenges of making smaller motors and components. This month we are going to mention a recent project that Reliant Systems has taken on that includes a 2,500mm travel motion stage. To put this in perspective most standard lines of long travel stages are 300mm, 400mm, and occasionally 600mm in travel length. This is only the travel distance, as the stage itself is generally longer. The need of one of our customers for a stage with 2,500mm of travel is over 4-6 times the travel and size of a standard motion stage. 2,500mm equates to roughly 8 feet 2 inches in travel length. 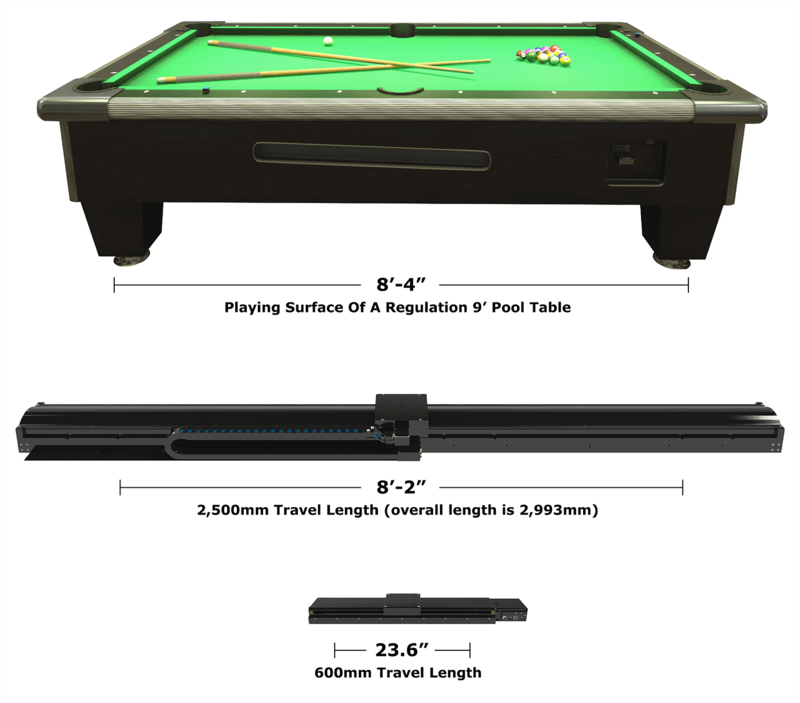 To put that in perspective…the playing surface of a regulation 9' pool table is roughly 8 feet 4 inches in length and the travel of a stage with 600mm of travel (which is considered long travel in automation) is roughly 23.6 inches. With the changes and growth in the laser industry, additive manufacturing, medical products handling, robotics, optical imaging, and the packaging industry, the travel limits are also growing. This requires some innovation on the part of engineering teams to solve the complex issues that sometimes arise from these projects. To build a stage with these travel lengths is one thing, but to hit performance specifications like traveling 100-500mm per second with repeatability, accuracy and stability at position with payloads of 100lbs+ requires careful motor, encoder and component selection as well. At a recent MD&M conference we were able to see some amazing innovation which most if not all required movement of a certain tool, product, laser, etc. The exciting part of automation is it requires motion. It's great to see our innovation helping to drive our customers businesses and makes us proud to be partnered and selected as the leader in precision standard and custom motion stages.